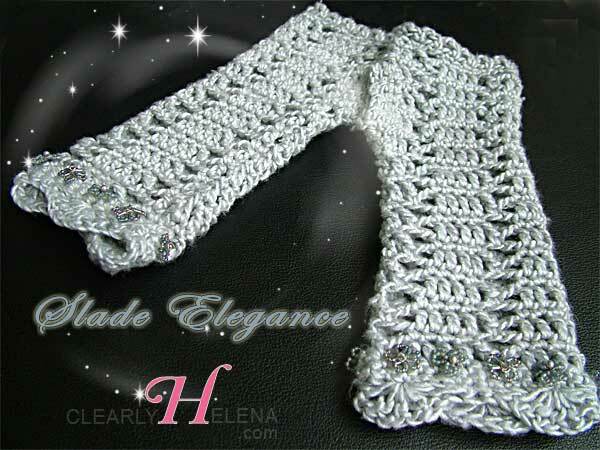 Handmade Crafts, named Slade Elegance, was originally made by request from Kerrie Slade. I truly felt the honour of this request because not only is Kerrie someone who is just lovely, inside and out - but she is also definitely one of the talented artistic people I most admire. In line with her collection of work in 2012. she was looking for something warm for her neck and hands and wanted something in silver or gray. After a bit of chat, we also decided that it would be a nice idea to incorporate some of the beads that she has been featuring this year - namely the Toho Transparent Rainbow Grey AB and the Frosted Transparen Rainbow Grey AB. I finished this a while back - well the main part anyway, but could not get fat Mr Procrastination out of my to do the final neatening up and closures. Which turned out well - coz in the end, by the time I did, I found it was perfect timing for me to gift this set to Kerrie in the hopes in will bring a smile to her face and a ray of sunshine, in a time when she is undergoing a very personal journey of great change and heart ache. 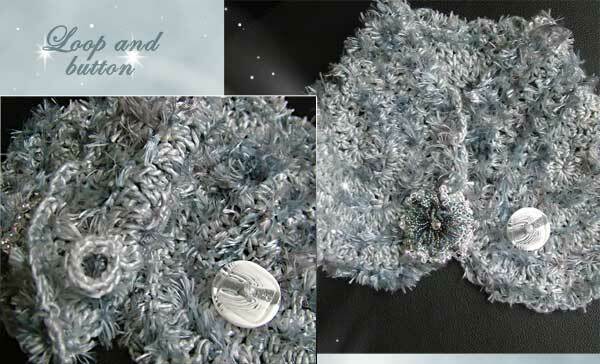 The neckwarmer is made from soft viscose yarn. Kerrie told me that her neck is very sensitive and just thinking of wool makes her "teeth and fingernails go all funny". Viscose I believe is an ideal choice. It is made from natural wood pulp, is soft, drapes superbly, and warm and snuggly. It breathes like natural fibers and has a silky sheen. As I have often said elsewhere, I LOVE viscose. The matching gloves are also made in the same yarn. I made wire flowers from the Toho beads and they have been crocheted directly into the gloves. More of this process below .. This here above shows the final shaping for the neckwarmer. I made it originally without the "bone" shaping but realized that it would fit the neck better, both visually and how it sits, if it had this "bone" shape. 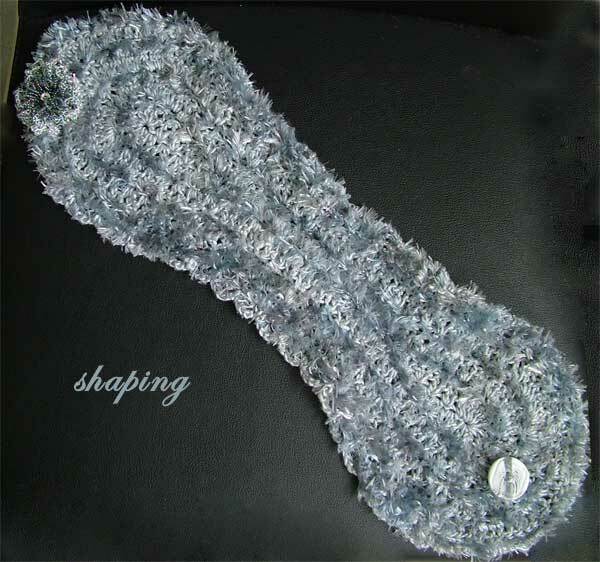 So rather than making a whole new one, I sewed down the center portion to create this "bone" shape. And it is a good outcome because not only is the sewn part quite seamless, but it also provide a thicker (hence warmer) portion for the area that goes round the back of the neck. And it is still soft and flexible. The center floral flower is a crocheted flower using lots of the Toho beads that Kerrie wanted. 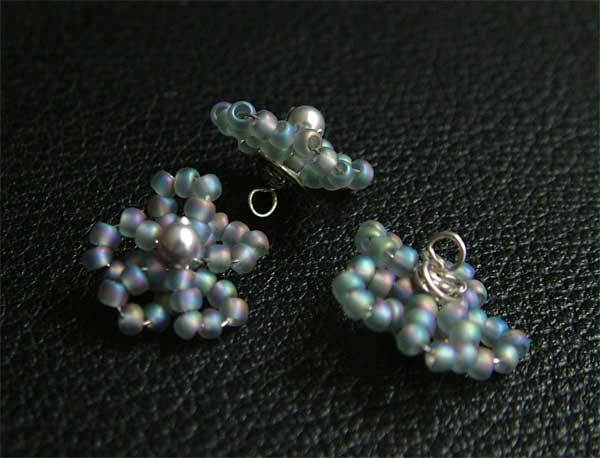 I have also incorporated some vintage (plastic AB) beads manufactured in the 1970s - '80s. These beads are extra precious to me coz my mom actually had to scout around in the hot sun in Singapore to find them for me. That was a long time ago and the area where those traditional shops used to be have been "cleaned out" by the government. 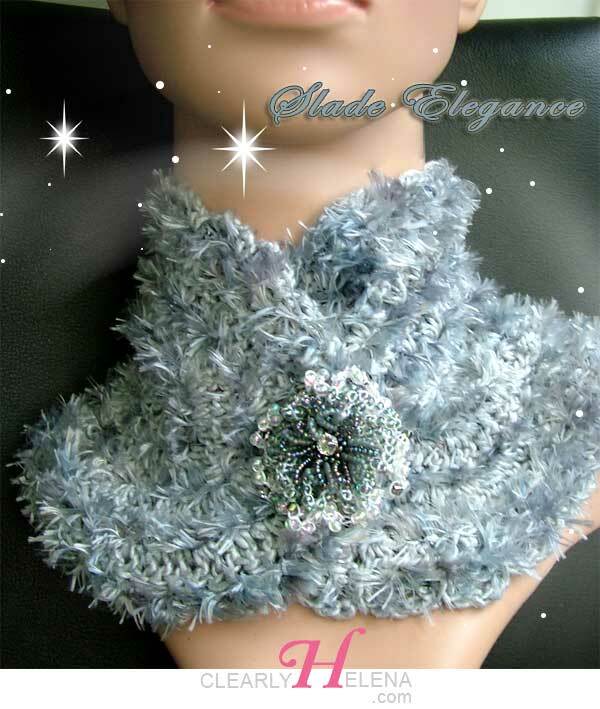 For that extra sparkle, I have added a large Swarovski rose montee to the center of the flower. It really does make a lovely difference! Photo above shows the closure for the beaded neckwarmer scarf. The button used is also vintage (made in 1950's - '60s). A crochet corded loop on the underside of the opposing side is made separately and woven in to complete the closure. 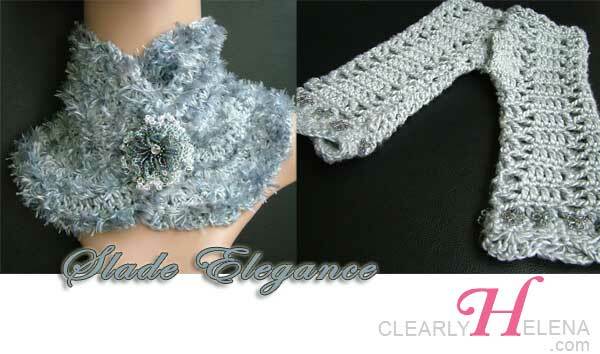 There are also a large variety of Neckwarmers - products and patterns available at Amazon. Some of the patterns are quite delicious and worth a look. 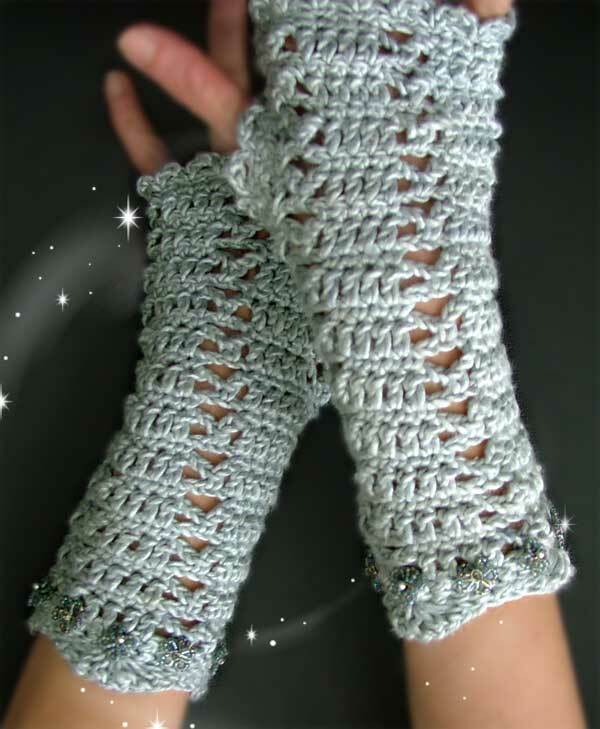 The fingerless gloves are also done in the soft, silky viscose yarn. I first made the little flowers - wire wrapped using 0.4mm silver wire and the Toho beads (seed beads and bugle - tho the bugles are not shown in the above photo). The photo above shows closeup of how the beaded wire flowers are made. The loop at the bottom is essential. Unlike most beaded crochet work, these are NOT threaded on before the crochet begins. Rather they are worked into the crochet, a flower at a time: the hook is removed from the yarn at the appropriate location. The hook is then "threaded through" the back loop on the flower and the yarn picked up again and pulled through the loop. Then the next crochet stitch is completed. 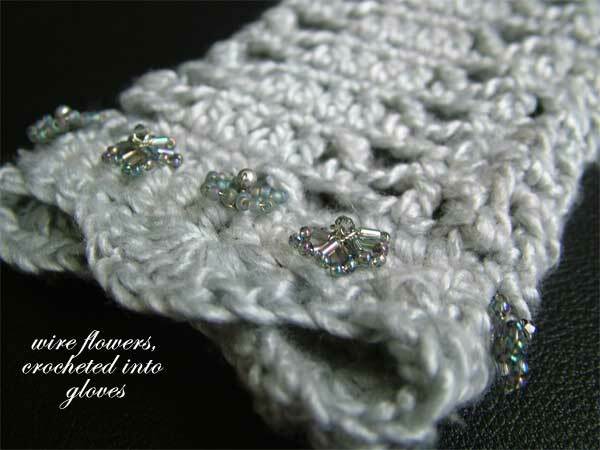 This method also ensures that the wire beaded flowers sit nicely"in" the crochet piece. 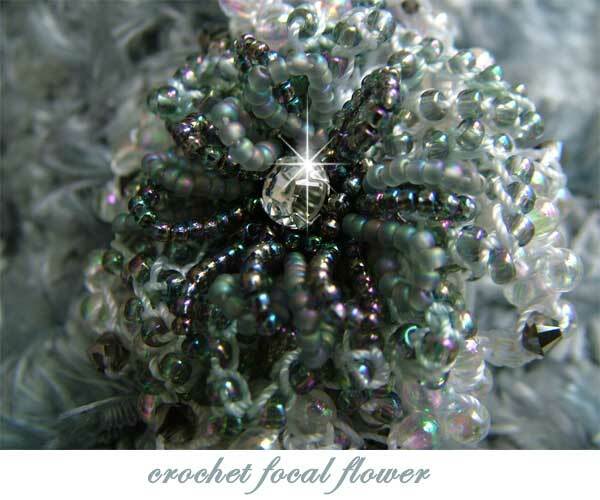 The center of the little flowers are made from Swarovski pearls and crystal bicone beads (3mm). The pearls are Light Gray and the XILION bicones are Silver Night. That's about it. I have just sent this set off to Kerrie in the hopes that it will bring a smile to her face and of course that they fit her. Wishing Kerrie a courageous and God-filled journey during this sad and challenging time.